An independently operated business, Craigiemains Home and Garden Centre stands on a large open site with ample car parking space and is continually being evolved to incorporate interest for the visitor. You will find a great selection of plants here throughout the seasons.There is a comprehensive collection of everything sundry for the garden enthusiast as well as an interesting choice of giftware.There''s something here for all the family, including the kids! Our Coffee Shop offers superb snacks, meals and drinks throughout the day. Open 7 days a week Craigiemains Home and Garden Centre is a gem in a sea of sand, very much worth a visit. We now have a gateway onto the Ayrshire Coastal Path, so walkers can now have easy access onto the path. 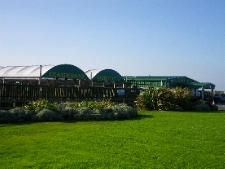 Craigiemains Home and Garden Centre is situated on the northern outskirts of Ballantrae village, bordering the coastline and close to the old fishing harbour. You will find a great selection of plants here throughout the seasons. There is a comprehensive collection of everything sundry for the garden enthusiast as well as an interesting choice of giftware.